Many are familiar with the famous "Fressgaße" (loosely, "Grazing Street") in Frankfurt (actually Kalbächer Gasse and Große Bockenheimer Straße) as a spot that has been known for shopping and eating since the turn of the 20th century. But Frankfurt is an ever-expanding city that has a whole lot more than just one street of "grazing" to offer! Take the ubahn to Eschersheimer Tor and walk north along Oederweg and there are all sorts of great places...I have eaten at Vipho (Vietnamese), Kowloon City (Chinese/Dim Sum), Gokio Bros. (Korean Fried Chicken) and all three are excellent, but there are many other restaurants there (Tex-Mex, Burgers/Steaks, Indian Street Food...many looked good). If you just keep walking north on that street, there are cute shops and stuff too. We walked north and eventually walked West on side streets to get back to the Gruenebergweg Ubahn stop to head home, but you could keep walking north if you have time as it looks like there's lots of cute stuff. This cute (short) street is adjacent to my favorite sushi place in the city, SuperKato. There are several adorable cafes and restaurants on this street. I haven't been to any of those but I think there's one that sells a bunch of soups that looked really interesting called Souper! Die Suppenküche. There's also a Tex-Mex Cantina. 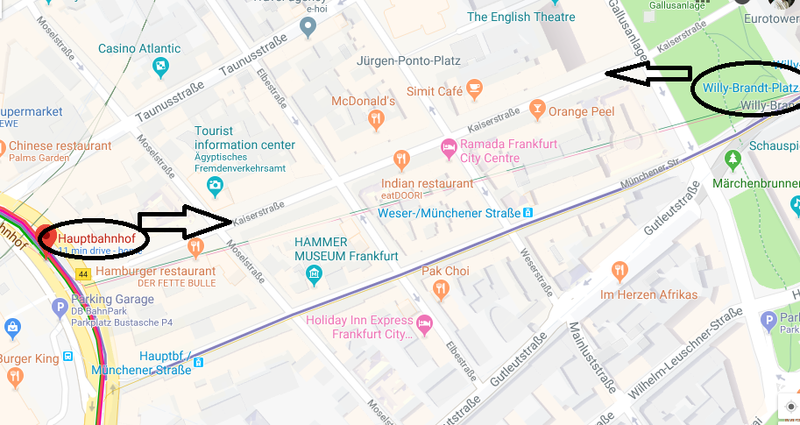 To get here, you could go to several different ubahn stations and walk...it looks like the closest might be Willy-Brandt or Hauptwache (which isn't shown on this map screenshot but is just North, adjacent to the Goetheplatz). I like this area because there's lots of shopping (not just on Neuekraeme, which is that street that leads to the Roemer). One of my favorite places in all of Frankfurt is nearby...the Kleinmarkthalle. 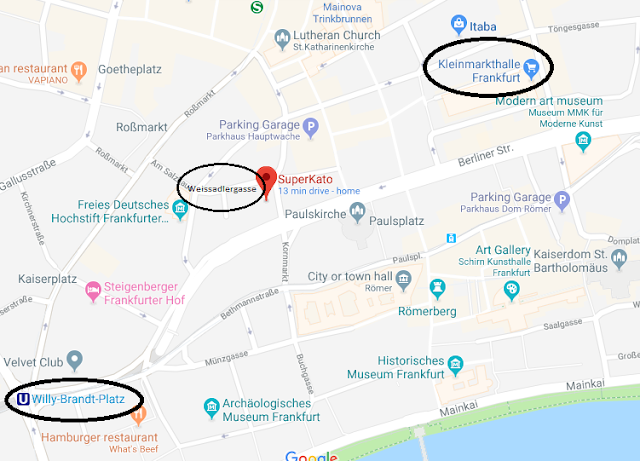 My Frankfurt universe rotates around Kleinmarkthalle. 🙂 Definitely worth a visit...it's a market but there are places to eat inside and even more upstairs, as well as a wine bar that's so much fun. The area of this street that runs between Willy-Brandt Platz and the Hauptbahnhof has a lot of good restaurants and is fun to walk. They also hold a lot of markets on this street (closer to the Hauptbahnhof end) when the weather is warmer. On this street I have been to Urban Kitchen (reliable cuisine from all over the world), EatDoori (Indian Street Food), and Kabuki (Japanese Tepanyaki--very expensive, special occasion type of place but AMAZING FOOD AND EXPERIENCE). 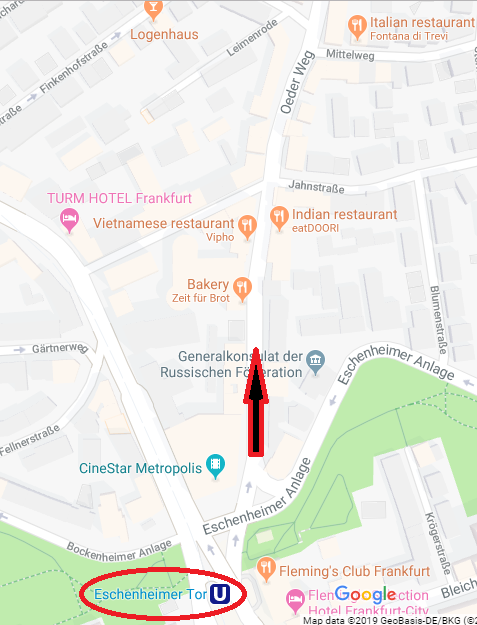 There are a lot of other places to eat on this street, and for shopping walk along Kaiserstrasse towards Willy-Brandt Platz (Northeast) and just continue walking until it turns into Rossmarktstrasse. You'll end up in the Hauptwache/Zeil area. Or you could follow Goetheplatz North to get to the "Rodeo Drive" of Frankfurt, Goethestrasse. Happy Grazing, and enjoy the weather!! Hello Again and Check me out on Facebook and Instagram! If you've landed on this page after doing a quick Google search, took a quick look over it, and then thought "Well, shoot...this is just one of those neglected blogs that the owner never does anything with............"
You'd be pretty much right. BUT! That doesn't mean I'm not doing ANYTHING! Quite the contrary...it's true that running The Global Fork catering company (not to mention my household...in a foreign country...with a big international move coming up...) DOES keep me pretty busy and I've neglected posting here around much of that, nor have I been good at providing you with the cool tips and tricks that I enjoy sharing. However, I am much better at keeping in touch with all of you out there via Facebook and Instagram. SO! 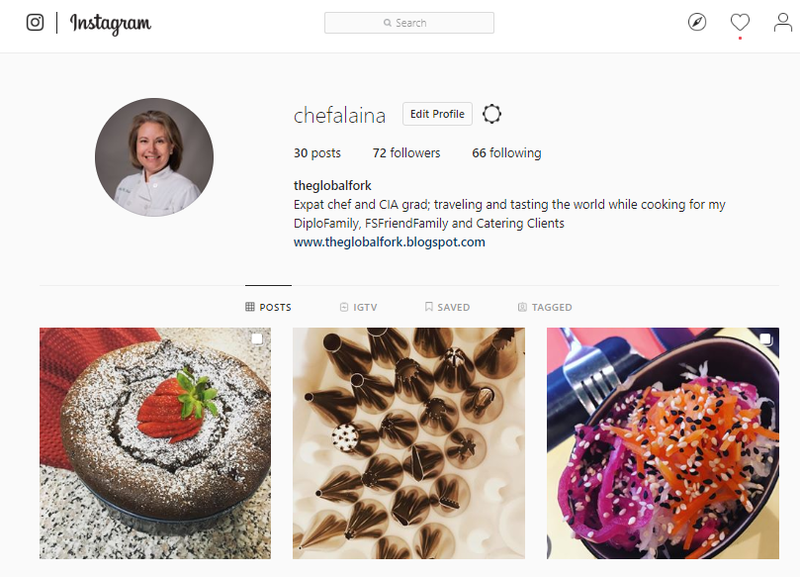 Head on over to your lil' appies there on your phone and search for @TheGlobalFork on Facebook and @ChefAlaina on Instagram. (You should also be able to find me under The Global Fork on Insta.) 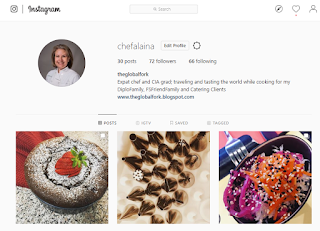 There you'll get nearly daily updates on the goings-on over here in my kitchen...oh and in all the yum yum restaurants I'm able to frequent, as well...all across the world! Speaking of restaurants, I've started putting together some restaurant guides that will be useful to you folks here in Frankfurt, so look for those COMING SOON! And as always, please feel free to comment or message me with your burning questions, catering quote requests, etc. etc. etc.! "Cooking in Germany" Tip - Potatoes! 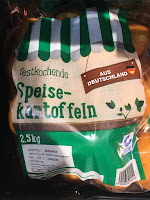 There are two different types of potatoes (Kartoffeln) most commonly found in German grocery stores, labeled “mehligkochende” and “festkochende”. 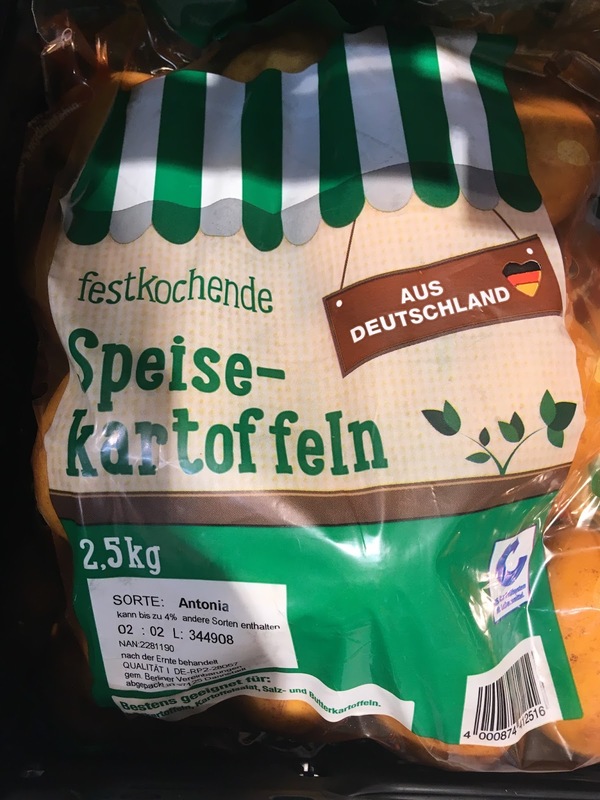 Festkochende Kartoffeln are high moisture potatoes, most similar to American Yukon Gold or chef’s potatoes, and are best for boiling, steaming, braising and stewing (whenever you’re using moisture to cook). The point here is that these potatoes already contain a lot of moisture, so they have a nice even consistency, but they don't fall apart when you cook them in liquid. This is important when you're making soups and stews, as the potatoes will retain their shape and not fall apart, so that your soup is not murky with chunks of potatoes everywhere. They're also great for potato salads for the same reason. These types of potatoes also boast great flavor. Mehligkochende Kartoffeln are high starch potatoes, most similar to American russet potatoes, and are best for baking, puréeing, and frying. After the potato is cooked, it still maintains a relatively dry interior, so it's very easy to flake it or mash it. For American mashed potatoes, you definitely want that consistency as opposed to wallpaper paste! These starchy, drier potatoes are also great for frying because they spatter much less and, due to less moisture inside, brown even better. Here's another tip regarding mashed potatoes! If you love making mashed potatoes and do it a lot (or are willing to purchase a useful piece of equipment to make it easier), I highly recommend buying a food mill. This is a light-weight, non-electric, handheld tool that generally comes with 2-3 blade sizes and works for effortlessly making the fluffiest mashed potatoes, but also is great for making your own applesauce, tomato sauce, pureed soups, etc. 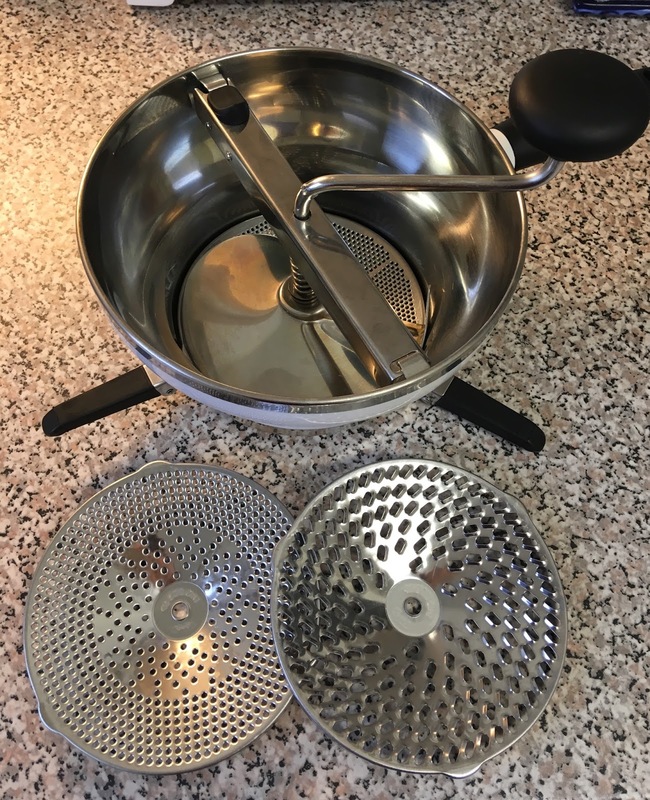 The beauty of the food mill is, not only do you get a quick, even mill/grate of whatever you're putting through it, but you also get rid of skins and seeds, eliminating the need to peel your potatoes, apples, tomatoes, etc. before cooking them and milling them. 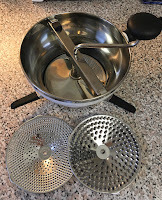 This is particularly useful for potatoes as you can help maintain the starches inside if you cook them with the skin on instead of peeling before you boil. If you're looking for a better selection of potatoes here in Germany, check out the Sunflower Gartenshop...they have an incredible selection of all sorts of types of potatoes that would be fun to try, not to mention other gourmet grocery items and a HUGE garden store with anything you could dream of. Look out for a future blog post on all that they have to offer! Have a question or need some help cooking here in Germany? Comment below or shoot me an email at TheGlobalFork@gmail.com! Hello "Heute" readers and welcome to The Global Fork! I'm excited you've come to check out my blog after reading my article in this week's newsletter. I hope it was helpful to you! Here's a link to my original blog post which inspired this week's article. First, I want to let you know that I run a small catering company here on the Siedlung. 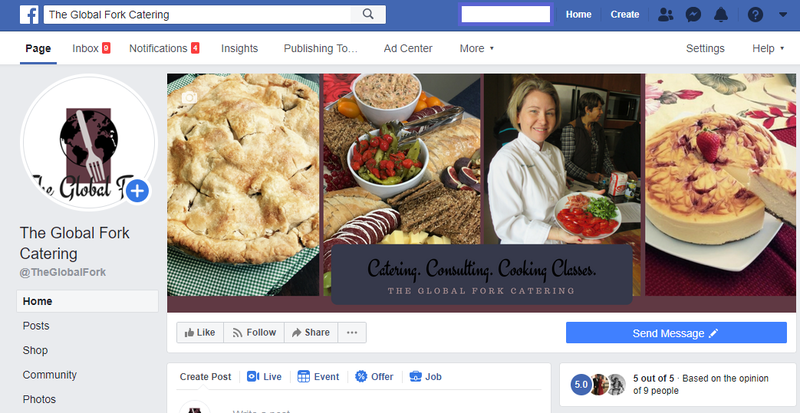 Please reach out to me for a free quote for any of your catering needs...I can help with something as small as dessert, cake, or pie for a small family get-together to a cocktail party for 100 people and everywhere in between. I'd really love to help make your event special for you and your guests through my love of food. 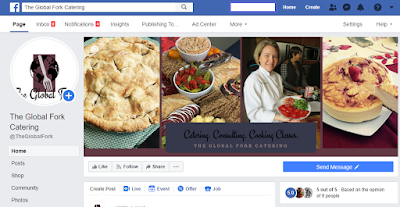 Just click on the Catering and Consulting tab (or right there!) and fill out my **Catering Proposal Request** with detail of your event and I'll get back to you quickly with ideas and a quote. Second, my blog is also here to help you through your tour in Germany and to answer all those ingredients and cooking questions you may have. You can either leave a comment on the blog with your questions or email me at TheGlobalFork@gmail.com. Now, down to the nitty gritty of why you really came to my blog...you probably want those Thanksgiving recipes! I've written a lot about Thanksgiving on this blog over the years so feel free to search around, but I'll include here recipe cards for Turkey brine, my gravy, and a very traditional turkey stuffing. Thanks again for visiting, happy cooking, and Happy Thanksgiving! 1 package turkey giblets from inside your turkey, or you can use turkey wings/legs/bones or even chicken giblets, bones, wings, etc. Preheat oven to 450 degrees F. In a large oven-proof saute pan, heat canola oil in oven until smoking. Add turkey or chicken pieces. Roast in the oven until golden brown, turning occasionally. Remove pan from oven and remove turkey or chicken pieces. Transfer pot to stovetop and place over medium heat. Add onion, celery, and carrot to the hot pan. Stir to crape up fond (the golden brown bits) from bottom of pan, and cook, stirring often, until soft and golden brown. Add dry white wine and reduce until almost dry. Add chicken broth and bring to a simmer. Temper roux into broth (this is important for avoiding lumps; more info in my Roux blog post) and bring back to a simmer. Add bay leaf and thyme sprigs and let simmer gently for 15 minutes. Strain gravy through a fine mesh sieve and discard mirepoix (onion/carrot/celery) and herbs. Add pan drippings (straining if necessary) and Madeira or Sherry. Allow to simmer 5 minutes longer and serve hot. When ready to brine your turkey, add the mixture of dry ingredients and fresh ingredients in a large stockpot with one gallon of water and bring to a boil, stirring occasionally. Remove pot from heat, add one gallon of cold water to the pot, and allow to cool to room temperature. Set up your brining bag inside your roasting dish, refrigerator drawer (removed from fridge) or other sturdy container. Remove inner packet of giblet, neck, etc. from your turkey. Place your turkey in the bag, breast side down, and pour cool brine ingredients into the bag on top of the turkey. Close bag tightly by twisting and using rubber bands around the neck of the closure. You want to try to seal the bag in a way that the brine liquid touches all parts of the bird. When ready to roast, remove turkey from brining bag and brush off any solid brine ingredients from skin of turkey. Season, baste and roast as you normally would. "Stuffing" is traditionally the term used for bread stuffing that you put inside your turkey while it bakes, while "dressing" is traditionally the term used for bread stuffing baked outside of the bird. Old habits die hard, though, so I refer to it all as stuffing. I do not recommend putting this stuffing into the bird while it cooks as that is generally considered unsafe, given that it is difficult for the stuffing (which will have raw turkey juices incorporated) to reach the appropriate temperature (165 degrees F) by the time the turkey reaches the appropriate temperature and needs to be taken out of the oven. Make this recipe your own by adding any additional ingredients you like, such as cooked italian sausage, apples or even nuts. If using fresh bread, cut into desired size (some people like large chunks of bread in their stuffing while others prefer extremely course bread crumbs) and allow to dry overnight or bake in a 350 degree F oven until crispy. When ready to assemble dish, in a large bowl mix dried bread with vegetables (they do not need to be reheated). Add sage and freshly ground black pepper to taste. In a small saucepan over medium-low heat, or in the microwave, heat 1/4 C butter together with chicken broth and 4 chicken bouillon cubes. Whisk to make sure all the bouillon dissolves. (Using bouillon cubes instead of more chicken broth allows you to have a concentrated flavor without a lot of liquid.) Mix butter/chicken broth mixture into bread mixture. It should not be too wet; add more bread crumbs if needed. Transfer to an oven safe casserole dish and bake at 350 degrees F for 20-30 minutes. Serve hot. A Kitchen/Baking Hack...that really works!!! I'm sure you've all seen the videos and read the articles on the internet with so-called "life hacks". Not surprisingly, I can't pass up a list of hacks that claims to make life in the kitchen easier, and I always eagerly click through. Also not surprisingly, I usually walk away not having learned much...generally these hacks don't actually work as advertised, and at worst they actually make things harder. But I ran across one a few weeks ago that I promised myself I would try one day, and today I got the opportunity. I was hired to do 60 cupcakes for a client's twins' birthday party at school. Easy, right? Except she wanted four different colors of frosting...ugh. I'm excited to work with gel food color and try out new hues and all, but my oh my the mess! It's bad enough when you have to refill a pastry bag multiple times in order to beautifully ice 60 cupcakes, but now I have to change colors, meaning I'll have to wash AND dry my pastry bag and all the accoutrement in between each color! Double ugh. Enter this amazing baking hack....... Instead of putting your icing straight into the bag, and thereby having it make direct contact and necessitate cleaning in between colors, you basically just make a little plastic wrap pouch, slide that into your pastry bag, put on the tip and go to town. I discovered that not only did this prevent me from having to wash the bag, but it took care of that yucky mess at the large opening of the bag that always seemed inevitable before. Heavens to Betsy, a hack that finally works. I was practically dancing as I easily discarded the empty plastic wrap pouches and loaded up my next color. Start by making your frosting as you normally would. Lay out a very long piece of plastic wrap on your work surface, and put your icing in the middle of it. Roll your frosting up in the plastic wrap, then twist tightly like a piece of candy. Slide plastic wrap "packet" into your pastry bag and pull one end of the twist through the small hole. Snip off extra plastic wrap (doesn't have to be close to the frosting) and attach your desired piping tip. Pipe as you would normally. Look!!!! No mess!!! Cleanup is a breeze! Just remove the empty plastic wrap packet. The only thing to clean is the tip, and you may have to run a paper towel through the bag, but that's it! Disclaimer: The views expressed in this blog are those of the author and not necessarily those of the U.S. Government, or of any agency or department of that government. Copyright Alaina Missbach 2017. Watermark theme. Powered by Blogger.